HAVE A LOOK! Click here for a color chart showing all 8 grommet color finishes of non-rusting, solid brass ClipsShop #12 (40mm, 1-1/2" ID 1.5" hole size), #8.5 (28mm, 1-1/8" ID, 1.125" hole size), #7.5 (25mm, 1" ID hole size) curtain eyelets drapery grommets & matching teeth washers with gripping nubs. 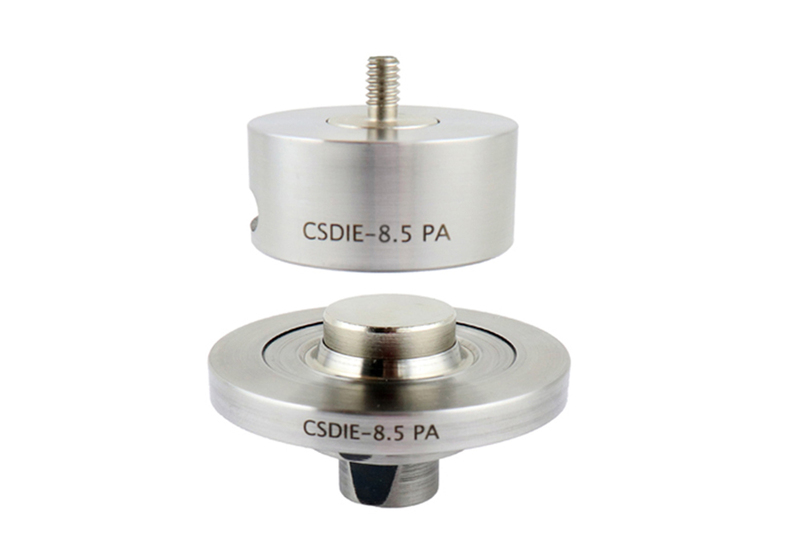 ► Hole Size after setting may vary slightly depending on the thickness of applied material and amount of pressure used. Due to production tolerances actual dimensions may vary slightly. 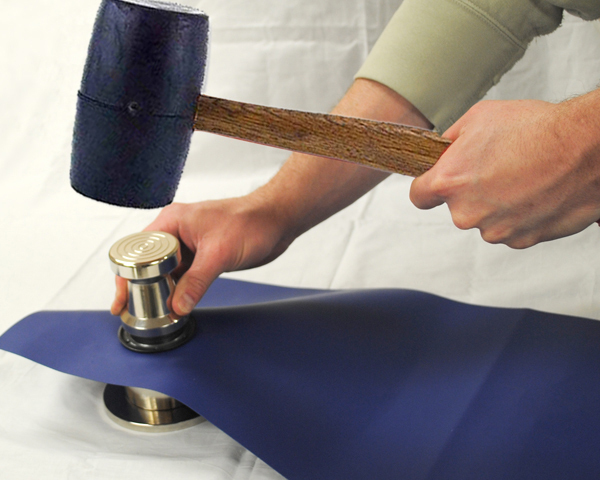 ► Our grommets are finished using a variety of natural processes. Each grommet color and texture will be unique. The chart is a close representation of the different grommet finishes, but the actual grommets can & will vary slightly from what's shown. 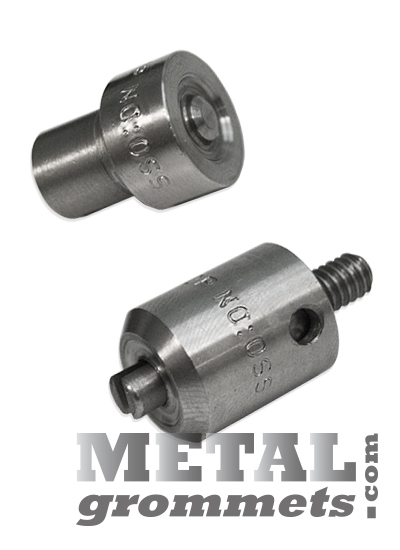 ► Manufacturing tools used to produce grommets are not all the same. It's possible that grommets made by another manufacturer may not be the exact same size or shape and may be called by a different name. Before you buy grommets, verify the inside dimensions are correct for you. 13 sizes of ClipsShop grommets are available from METALgrommets.com in nickel, brass, antique brass and chemical black oxide. 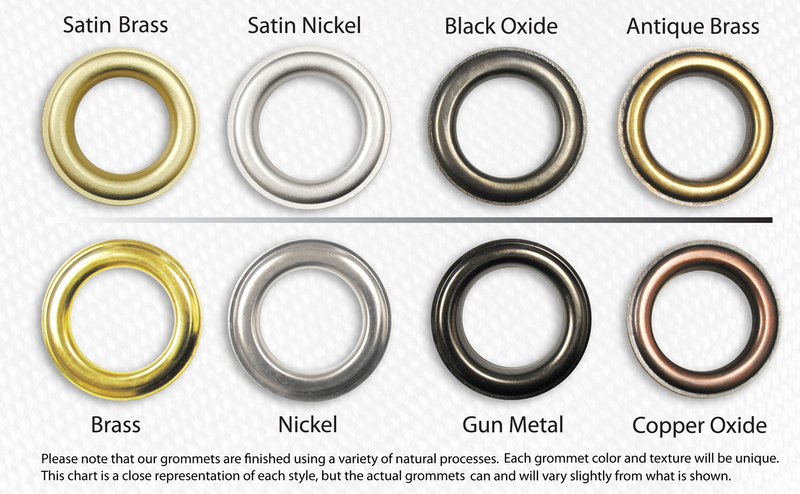 Large grommets with 1", 1 1/8", 1 1/2" (40 mm) are also stocked in satin nickel, satin brass, gun metal and copper oxide. The quality of ClipsShop brand curtain eyelets is recognized worldwide. 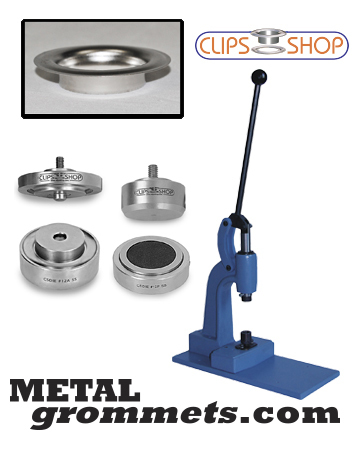 Do you already own a Rowley grommet press? You could replace it with a reliable, heavy-duty ClipsShop grommet machine or you could do what some other happy METALgrommets.com customers do! 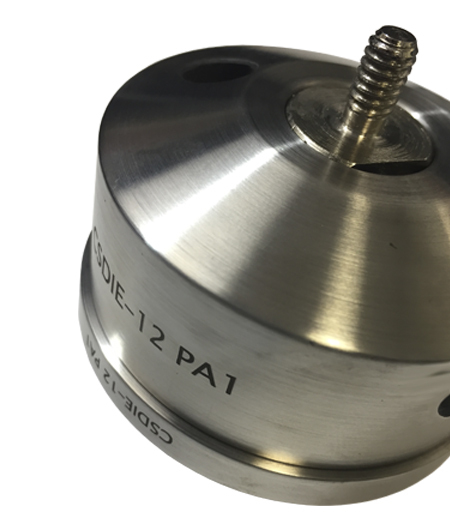 Many say that they successfully attach ClipsShop #12 (40 mm) curtain grommets using their Rowley grommet setter. Individual results may vary. It's the responsibility of the user to test suitability. Open bags of grommets are not returnable. Buy solid brass grommets from ClipsShop below. Brass is corrosion resistant, will not rust and is non-magnetic. Choose a curtain eyelet size to buy quality European-made large metal grommets in a variety of finishes & colors. Use grommets to make your project perfect, love grommets because they're attractive & durable, Buy grommets from METALgrommets.com. They make holes strong and add decorative accent and beauty to many projects.